The robot on the cover is Crowbot, traditional medium oil on board. 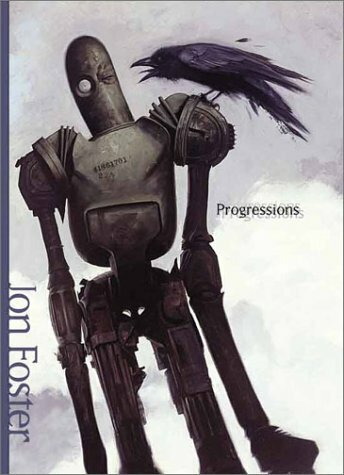 Jon Foster likes robots. In this 80-page art book, there are quite a few. Progressions is a portfolio book of illustrations, personal and commissioned work. Big name clients include Wizards of the Coast, LucasFilm, etc. For the full colour illustrations in the book, they are mainly traditional medium. Sometimes, Jon Foster does work on them digitally to repaint certain aspect, as mentioned in the very few captions that appear in the book. I like the lighting for the scenes he creates, very subtle with that occasional slight yellow tint. The concept sketches and digital paintings are all in black and white. This art book is very character design focused. Most of the illustrations are actually portraits or scenes with the focus on characters. Revolution: The Art of Jon Foster, the art book after this, packs more art. Quality of the hardcover binding for this book isn't really great. The pages might come off (as in my video) if the book is not taken care of. Jon Foster has a homepage and you can check out more of his wonderful illustrations there. Thanks for the review! I wish they would reprint this. I am no way paying $300 for a new copy!